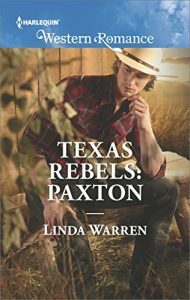 I finished this book, Texas Rebels: Paxton by Linda Warren a few days ago and wanted to sit on it before I wrote the review. I did love the cast of characters in this series because I feel they demonstrate what family is all about. I enjoy how the characters are incorporated in the community of Horseshoe, Texas. They are really well developed and make the story heartwarming. This story added Miss Bertie who brought a bit of humor into the book. Her granddaughter, Remi, is the heroine. All that being said, less than a month ago I read Texas Rebels: Elias by Linda Warren which was my first time reading a book by her, and the first book for me in this series, Texas Rebels. I absolutely LOVED it. Therefore I was very excited when I got my hands on this book, Texas Rebels: Paxton. This is a classic example of why I typically avoid reading series. While I enjoyed this book, I was disappointed that it didn’t meet with the high hopes I had of it being another awesome book like Texas Rebels: Elias was. Each book in the series can be read as a standalone. I wonder, if I hadn’t read the other book first, might I have enjoyed this one more if I hadn’t had the expectations from reading the other story first? Unfortunately, I did have high hopes and now I need to write an honest review. Fortunately, Texas Rebels: Paxton does have some positives worth mentioning. The heroine, Remi, was literally weak and strong at the same time. She was recovering from an accident that left her severely injured. As a result she was filled with the conflict of “woe is me, how will anyone love my scars?”. Yet, she possessed the determination to exercise and work hard towards getting better. I struggled with connecting with her because of the way she was written: a selfish individual with bursts of being a thoughtful person only to go right back to her “all about me” attitude. The plot thread that reveals why and how the accident happened was foolish considering we’re talking about a grown woman. However, it further established her self-centeredness. It didn’t help that her first scene in the story portrayed her as rude. I believe in love at first sight but is it powerful enough to change a person over night? The hero, Paxton, was described as a selfish, famous lover boy rodeo champion. But, after meeting Remi, he decided he wanted to change into a family man overnight. It was a tiny bit hard to believe. Even his other brothers were calling him out on it, asking what has gotten into him. I believe people can change but I’m not sure it can happen overnight. Try as you might, it’s not as easy as this book made it out to be. It did help that his other brothers had gotten married and started having families. Paxton was starting to feel the pressure of changing his ways and meeting Remi just reinforced his decision to change. But I felt like the change was a little abrupt. The plot thread with Remi’s brother, Ruger, could have been deleted and I wouldn’t have missed it. I didn’t connect with that development very well. I understand Remi wanted a relationship with her brother but he annoyed me. He was old enough to figure the truth out for himself and stand up to his uncle and make his own decisions. However, I understand how Ruger was a necessary character in the plot as another attempt to connect the stories in the series by reminding readers of the rivalry between the Rebels and the McCrays. The plot thread with Annie, the baby that Remi wanted to adopt, was a struggle for me, which is sad because it was a significant plot point. I felt like it took the spotlight away from the developing romance between Remi and Paxton in the beginning by constantly making the book about Remi. However, as the story developed, Annie became less and less about Remi and more about Paxton and Remi as a couple. I imagine this string of events regarding Annie was an attempt to incorporate drama into to plot. At this endeavor I’ll admit the author succeeded. Remi and Paxton as a couple were okay. They appeared to be compatible. Paxton grew on me to the point that I did believe that he loved Remi and was a changed man. Eventually, Remi grew on me also and I felt that they were meant for each other. I didn’t appreciate how they took some time apart near the end. I’m sure that was another attempt at pulling heart strings and drama but only succeeded in annoying me. I thought it was cute how their relationship was equated to two geese named Henry and Henny. That element was a nice, unique and appreciated touch. It is necessary for me to mention that this was a super-fast paced book – everything happened very quickly. My interest was captured right from the start and held throughout the story until the end despite my connectivity struggles. I feel the story could have slowed down some because I felt rushed. I can’t help but wonder if that is also why I struggled as much as I did to fall in love with this story. I desperately wanted to love it as much as I did the previous book. In conclusion, I do recommend this book for other readers to give it a try. I strive really hard to be honest in my reviews but I feel my review of Paxton is slanted or biased based on my previous experience in reading Elias. I am willing to try another story about those Texas Rebels, though, as there are enough positives in Paxton to recommend that other readers or fans of Ms. Warren give this one a try.